All That Glitters: What Next? Home→Charts I'm Watching→All That Glitters: What Next? GC climbed 62 points to 1782.50 today, completing a bearish butterfly pattern and then establishing an intra-day double top. 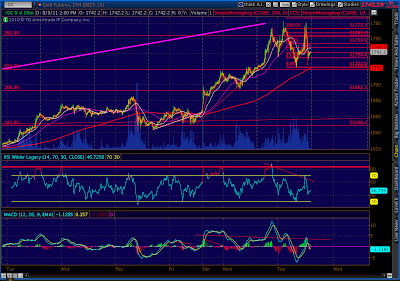 Post the Fed announcment (with no QE) it fell 56 to 1717 before closing up 26. It was an impressive reversal that reinforces the notion that investors were counting on QE to fuel the next spike. 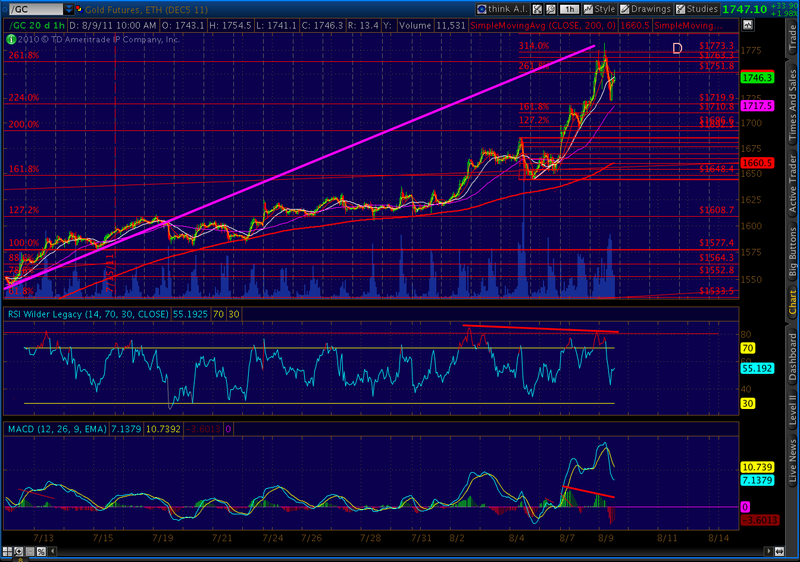 I’ve been watching the divergence setting up on gold’s hourly chart for the past week or so. It’s getting pretty extreme, leading me to believe something’s gotta give. In addition, the bearish butterfly pattern (on the daily chart since May 2) has extended to the 2.618 level, and the smaller, nested bearish crab pattern (on the 60-min chart since Aug 4) has extended to the 3.14 level. If these patterns were to play out, the correction could be impressive. 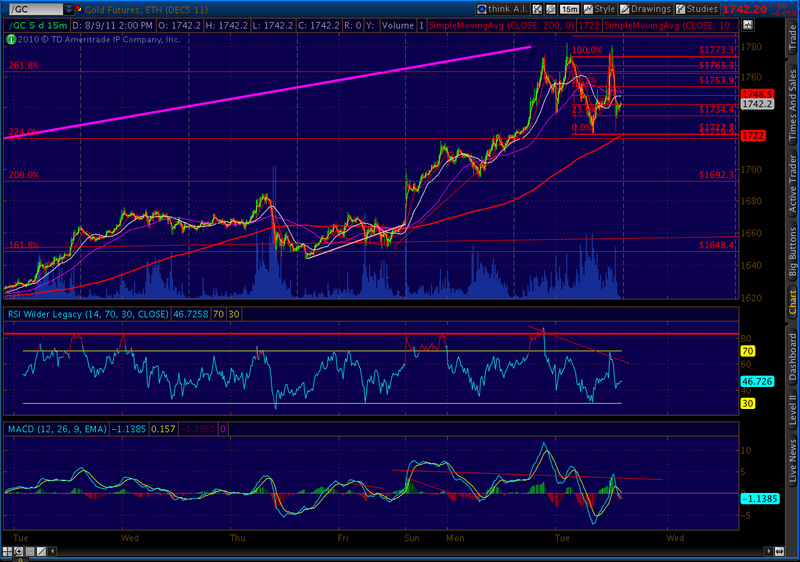 A garden variety .618 retrace (of DA) would indicate a 200 point decline to 1533. 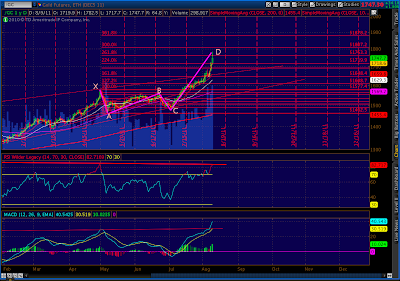 A typical 1.618 retrace would take gold to 1263. 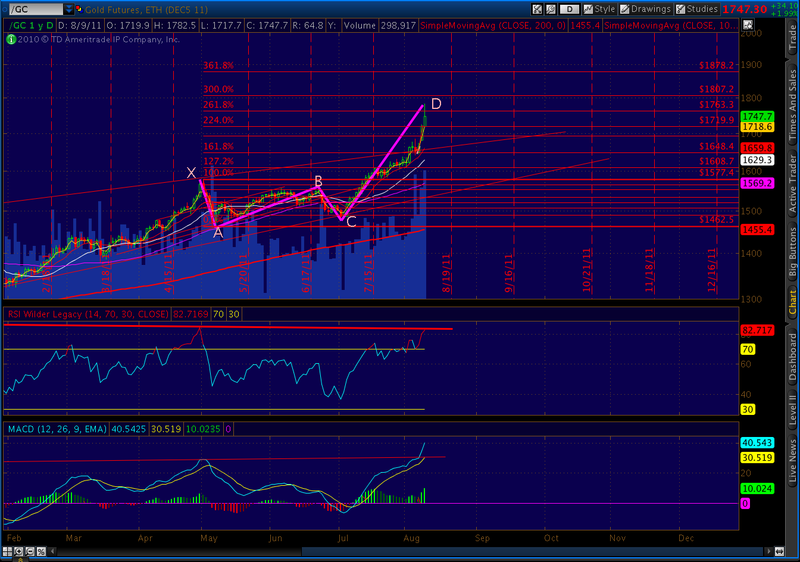 It’s important to note that butterfly patterns can end at any extreme Fibonacci extension of the BC leg. Although the most typical ones are 1.618, 2, 2.24 and 2.618 (where we are now), it’s possible we’ll extend further. The 3.0 extension is at 1807 and the 3.618 at 1878. So, stops make a lot of sense. Getting away from the technical picture for a moment… it seems the entire run up has been predicated on the certainty of a declining dollar. It’s an easy scenario to believe, since the Fed has so thoroughly trashed the dollar in previous rounds of QE. And, they could certainly try it again. We’ll know soon enough. But, if they don’t, this is one very over-extended puppy. I like the risk/reward very much — not enough to bet the farm on, but definitely worth a shot. My thoughts are that the relevant Fib level is 4.236 (division of Fibonacci number n by Fibonacci number n-3, limit as n approaches infinity), which is $1942. A top there would have the nice ironic factor of being just below the psychologically significant $2000 level, sort of like silver topping at just shy of $50. Granted, markets don't run on irony, but…. I think gold could move to the 1878 level which would be correlated with the Dollar making a long-term double bottom. As expected, no QE3. 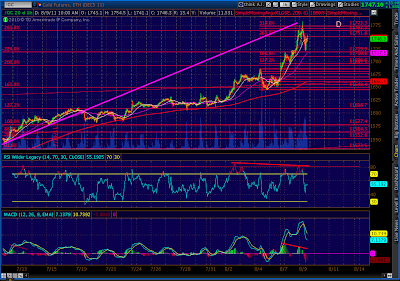 While there was a sense that the market might crash without mentioning of QE3, the market held 1100. Yes it dropped 50 points from the top. But it is still not a crash. This leads me to think the bounce that had been thoroughly sold in the past week is actually here.